Enjoy a stylish Mövenpick Restaurant with up to 175 seats. The modern design and warm colours create an attractive atmosphere that invites you to relax and linger at the bustling airport. 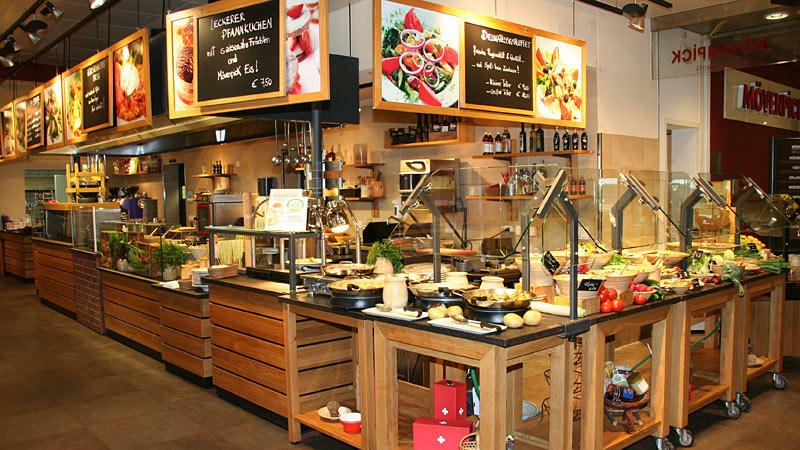 Food and drinks are presented in Mövenpick’s established high quality, and you can watch the cooks at work over their pots and pans preparing the traditional Swiss dishes. All food is prepared fresh in the open kitchen. The varied menu ranges from Mediterranean buffet, Sunday brunch and Rösti day to candle-light dinner – drop in and treat yourself to some of our fine food.